Before he was old enough to vote, Erickson Lubin had already been tabbed as the United States’ best bet for Olympic gold in 2016. He has been introduced to the sport before he entered kindergarten, tagging along behind his older brother to the gym at age 4. At 16, he won a National Police Athletic League title. At 17, he won the National Golden Gloves, and cruised through an international tournament in the Dominican Republic. Then, the day he turned 18, he signed a professional contract. It was a sign of the times. In a different era, winning an Olympic gold medal was a regular step in the line for a precocious young fighter. Stars like Floyd Patterson, Muhammad Ali and Sugar Ray Leonard were household names before they ever stepped into a professional ring, thanks to their Olympic gold. Lubin made the calculation that he was better off jumping right into the professional game. At this point, it’s hard to argue he didn’t make the best decision. Had he remained amateur through last summer, he would only now be getting his feet wet as a pro. Instead, he is now poised on the brink of stardom. Lubin’s record now stands at 18-0 with 13 KOs. 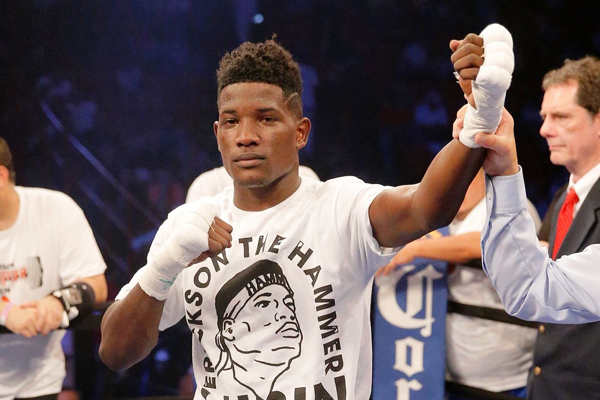 Last Saturday night in Brooklyn, he knocked out veteran Jorge Cota, to earn a shot at WBC 154-pound title holder Jermell Charlo. It has been a long time since an American fighter generated this much excitement at such a young age. It is important to note, Lubin has not faced anybody with the talent of Charlo. But it’s also worth noting, the people who handle Lubin’s career, people know a lot about the sport, seem ready to sign off on that fight. Lubin has hardly been handled with kid gloves so far. He has some very experienced fringe contenders and journeymen and looked devastating against them. His win over Cota was the most impressive work I have seen from him so far. The southpaw landed a sneaky, looping lead left in the first round that rocked Cota. After that, he bided his time and waited for the opportunity to throw the same punch. In Round 4, he saw it. This time he loaded up on the punch and sent Cota to the canvas. The gallant Sinaloa native beat the count, but was in no condition to continue.